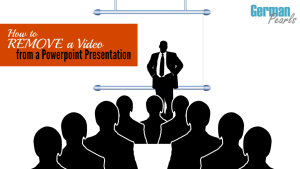 Want to remove a video from a powerpoint presentation? Including a video in a presentation is a great way to keep an audience engaged. In our previous post we showed two methods for adding a video to a Powerpoint presentation: linking to a video and embedding a video into the presentation. Suppose you have a presentation with an embedded video and you want to remove the video to save it as its own file. It’s a bit more complicated that right clicking on a picture and saving it (but very doable!). In this post, we’ll walk you through removing an embedded video from a Powerpoint presentation to save it as a separate file. The file will save as a .ppt or pptx file, depending on the version of Powerpoint you’re using. This means that when you save it, the file name will look something like this: presentation_name.ppt. Next, change the file to a zip file by changing the extension on the filename. If you’re using Windows 8 and don’t have a start menu check out this post on how to easily add a windows 8 start menu. Find the presentation file, ie: presentation_name.ppt. If you can see the .ppt or .pptx extension, great, go to the next step. If you CAN’T see the .ppt and the file name just looks like presentation_name then you’ll have to adjust your settings so you can see the .ppt. To do this, go to the view menu and, in the show/hide section, click the box next to ‘file name extensions’. Now you need to extract all the files within your newly created “zip file”. All the components of the presentation, including the video, have now been separated into individual files. You’ll now find the video file so you can remove a video from a powerpoint. When the extraction is complete and the extracted files window pops up you’ll see several file and folders. You now have the video saved as an individual file for use later! Did you notice the other files that were extracted during this process? Those can now be saved as individual items as well. If you have any questions or ran into any trouble in doing this, leave a comment below so we can help. From a very long time, I wanted to remove a video from my presentation. And you have provided very clear steps for the same. Now I am sure that I will be able to remove it. Glad I could help! When I wanted to do this it wasn’t obvious how to do it so I was hoping this post would help others trying to do the same thing.